PRODUCT DESCRIPTION: This functional brace is designed for the treatment of diaphyseal fractures of the tibia and fibula. The preformed design provides post operative support following intra medullary nailing and removal of internal or external fixation. The brace allows for movement of joints above and below the fracture site, increasing vascularity and encouraging bone growth. 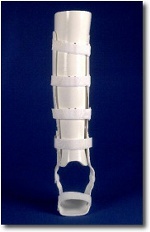 For a more custom fit the brace may be modified with a heat gun and trimmed with cast scissors. A double axis shoe insert is provided to aid ambulation and prevent distal slippage. Two cotton stockinette included.